Singer had a keen interest in Polish-Jewish history. His first novel, Satan in Goray, deals with a pogrom that took place in 1648, and he also deals with this period in a later novel, The Slave. Many of his writings were first published in newspapers and magazines; later they were translated from Yiddish to English, and published in book form.2 Singer sometimes translated his own works into English. Though he wrote numerous novels, his fame rests chiefly on his short stories. He was a student of the short-story form, and read Maupassant, Chekhov, etc. Several of his works were made into movies, including the novel Enemies, a Love Story, and the short story “Yentl.” He wrote many books for children, and his memoir A Day of Pleasure: Stories of a Boy Growing Up In Warsaw won the National Book Award for Children’s Literature. Singer’s father was a rabbi, and Singer was steeped in Judaism. In his early 20s, though, he broke with his father’s world, and “he stopped attending Jewish religious services of any kind, even on the High Holy Days.”3 He had some connections in the Polish-Jewish literary world — two of his older siblings were writers — and he had a literary reputation at a young age. In 1935, when he was 33, Singer moved from Poland to the U.S. He felt somewhat out of place in the U.S., and published a novel called Lost in America. I also read a Singer story called “A Friend of Kafka.” It’s a lively and readable sketch of an aging Yiddish actor who, in his younger days, knew Kafka. It provides a glimpse into Jewish intellectual life, though it says nothing of interest about Kafka. At the door of the hovel where I lie, there stands the plank on which the dead are taken away. The grave-digger Jew has his spade ready. The grave waits and the worms are hungry; the shrouds are prepared — I carry them in my beggar’s sack.... When the time comes I will go joyfully. Gimpel’s joyful acceptance of death is typical of sages in all cultures. In “Gimpel” and other stories, Singer introduces spirits and demons. Apparently he was receptive to the occult; in an interview, he “stated that he believes in demons both substantively as literally existing powers and symbolically as representing human behavior.”5 Singer won the Nobel Prize in 1978. He discusses ghost stories in his charming Nobel banquet speech (not to be confused with his Nobel lecture). My daughter had heard about cruises from her friends, and I’m interested in traveling, so we decided to take a cruise in the Caribbean. The cruise set out from San Juan, Puerto Rico, then stopped at St. Thomas (U.S. Virgin Islands), St. Croix (U.S. Virgin Islands), St. Kitts, Antigua, and St. Lucia, before returning to San Juan. We set out on the night of Friday, February 12. 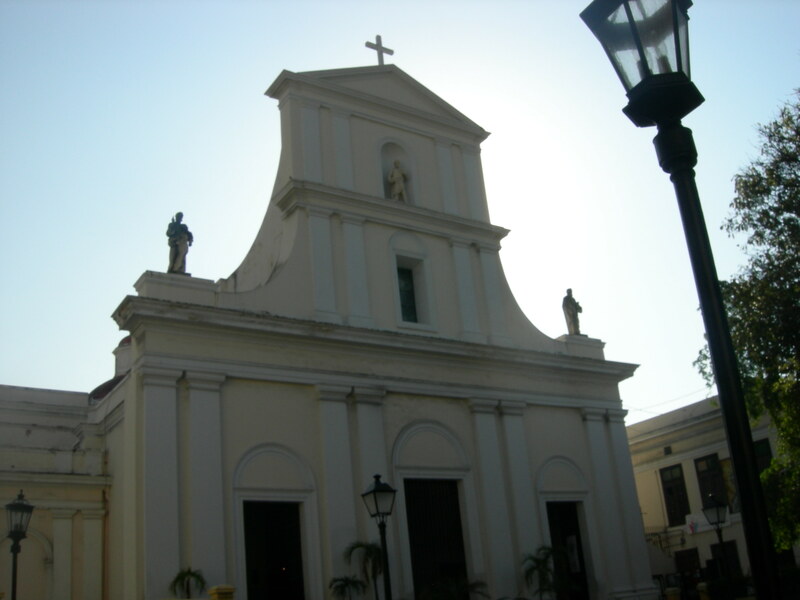 We flew from Boston to San Juan, arriving in the early morning. We asked a cab to take us to the dock where we thought our ship was, but there was confusion over which dock. When we finally arrived at the right dock, our cruise line didn’t want us, or our luggage, for another five hours, so we had to make a new plan. Our introduction to The Enchanted Isle (La Isla del Encanto) was rather disenchanting. 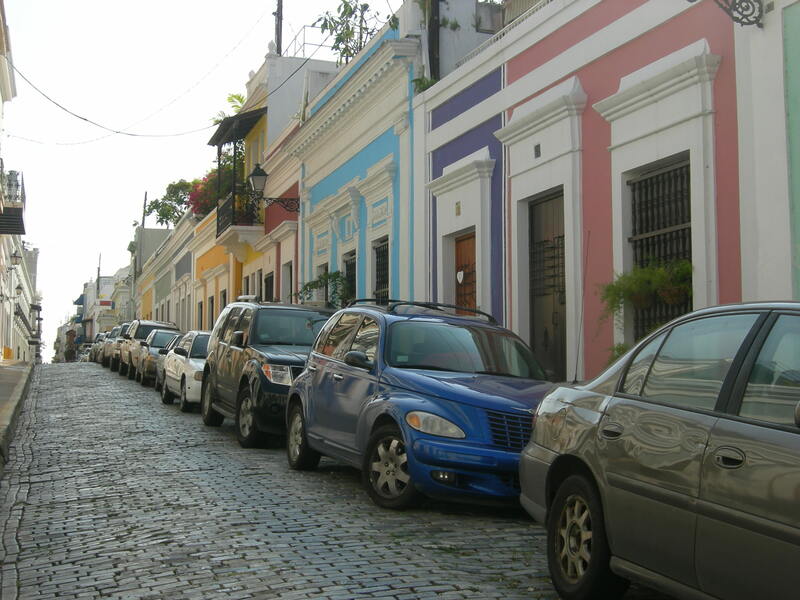 We took another cab to Old San Juan — the old section of San Juan, once enclosed by a wall — and asked the driver to drop us at Barrachina, a restaurant known for storing luggage. (It’s also known for a loftier achievement — inventing the Pina Colada.) Though we hadn’t slept much, we began exploring the old city. San Juan was heavily fortified because it’s the chief natural harbor in Puerto Rico, and Puerto Rico was regarded as the key to the Caribbean. For ships coming from Europe, Puerto Rico is the first large island they would encounter, the first island with a supply of fresh water, and the island that the trade winds would bring them to. 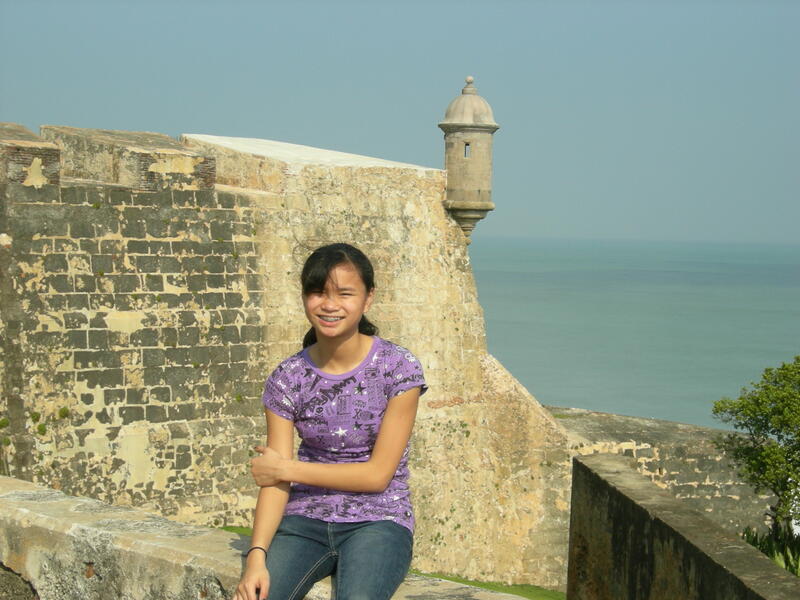 Perhaps it was San Juan’s fortifications that allowed Spain to maintain control of Puerto Rico for 400 years — from 1493 until the Spanish-American War in 1898. 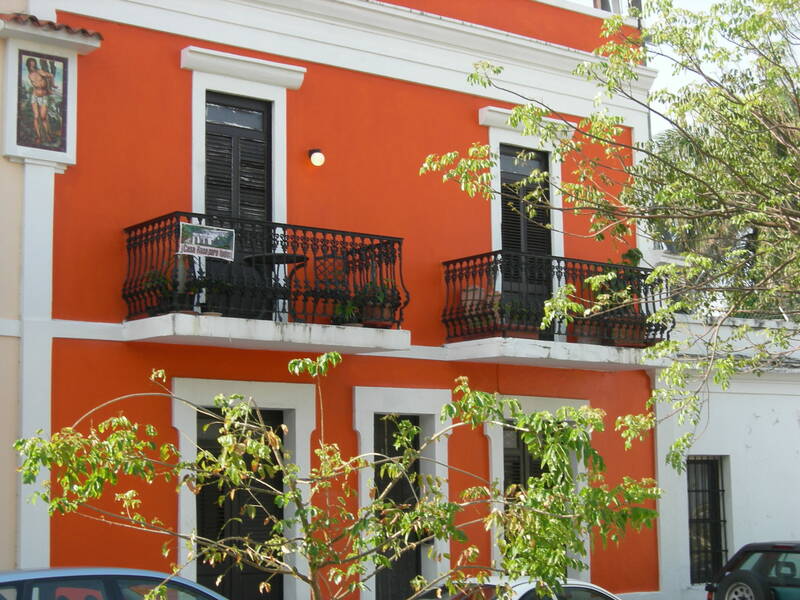 Old San Juan isn’t the only tourist attraction in Puerto Rico. There’s a popular resort in the southeast, Palmas del Mar, a rain forest called El Yunque, and a cave system called Rio Camuy. When we finally boarded our ship on Saturday afternoon, we went to the top deck to play basketball. After five minutes, our hands were black with dirt. Later we learned that the Montserrat volcano had been acting up, and spewing ash far and wide — including on the top deck of our ship. The volcano emits so much ash that laborers must be brought to Montserrat to assist in ash clean-up. The volcano was a frequent topic of conversation — especially on Antigua, which is near Montserrat. When we were on Antigua, our taxi driver told stories about Montserrat farmers who were eager to harvest their crops before the volcano erupted, but they stayed too long, and were caught by the lava. Apparently Montserrat experiences many small earthquakes, as well as volcanic activity, and some of these earthquakes are serious; one even caused damage on Antigua. I made a trip on foot across the island.... We passed the crater of a volcano. The air was sickly with the smell of sulphur. It was a vast vat of a cauldron with its rocks stained green and yellow and the tepid steaming water cloudily, milkily white.... St. Lucia can offer nothing more impressive. If the Montserrat volcano was a frequent topic of conversation, hurricanes were an even more frequent topic. Our taxi driver said that one hurricane in 1995 raged for 36 hours, dropped 36 inches of rain, denuded every tree on Antigua of its leaves, and submerged entire houses under water.10 Hurricanes, volcanoes, earthquakes — the Caribbean has more than its share of natural disasters. Is there any populated region of the globe that feels the force of nature more than the Caribbean? Just this year, more than 100,000 people were killed by an earthquake in Haiti. Another frequent topic of conversation is immigration. Every island seems to have illegal immigrants from the Dominican Republic, Jamaica, etc. Some people complain that these immigrants fill all the jobs, and leave natives jobless. Another complaint is that they raise the crime rate. Some political parties try to turn these immigrants to their advantage by befriending them, registering them, and obtaining their votes. But this is a dangerous strategy, and it sometimes alienates natives, and backfires against the party that pursues it. On Antigua, our taxi driver said that English is widely spoken, but among themselves, the islanders speak a “broken English” — a combination of English and African languages. The U.S. dollar is widely accepted, but the chief currency is the East Caribbean Dollar, which has Queen Elizabeth II on its notes and coins. On Antigua, our taxi driver pointed out hundreds of street lights, and said that the Chinese had donated them to the island. He said that the Chinese were carrying out such projects all over the Caribbean. When I asked him why, he said that he thought they were trying to take over the world. The street lights are erected by Chinese workers. The workers never mingle with the local people — never go to restaurants, etc. Perhaps they want to avoid quarrels, scandals, etc. As we talked to people who live in the Caribbean, we found that many of them travel to the U.S., or have a “green card” and divide their time between their island and the U.S., or send their children to college in the U.S. We also met Americans who work in the Caribbean during the winter, then go to the U.S. during the summer, and work in Alaska, or in a tourist destination like the Grand Canyon. We boarded our ship on Saturday afternoon, and set sail for St. Thomas on Saturday night. As we left San Juan harbor, we had a good view of an illuminated El Morro. In general, though, we didn’t see much from the boat, since the boat sailed at night, and the cruise line made no attempt to point out sights, or comment on the geography/history of the area. When we woke up each morning, we found ourselves at a new island that looked much like the previous island. The cruise line made little effort to show us the distinctive history, and the distinctive scenery, of each island. The cruise line seemed to feel that it was their job to make us comfortable on the ship, but it was our job to explore the island. True, they offered various shore excursions, but these excursions seemed pricey rather than rewarding. The cruise line didn’t lead the excursions, it merely arranged for local guides. Perhaps the best way to make a shore excursion is to collect a group of about four people, hire a taxi, and split the cost. If you’re considering a cruise, ask if there’s a professor/lecturer on board, and ask the prices of shore excursions. Consider a cruise organized by a college alumni group; such cruises usually have professors from the college. Also consider a cruise organized by Semester At Sea; though some of their cruises are for college students, they also offer “Enrichment Voyages” that are open to all ages. Educational cruises are also organized by ElderHostel. And then there are upscale cruises run by companies like Tauck and Lindblad. Instead of an ocean cruise, you might consider a river cruise; Viking River Cruises offers cruises in Europe, Russia, Egypt, and China. Some of these cruises are more expensive than our “philistine cruise,” which was only $1,200 for two people, for 7 nights, with all meals included. Perhaps the cruise was cheap because the company makes their money on extras like alcohol, gambling, Internet access, shore excursions, etc. The cruise line seems to view passengers as “captive customers” to whom it can sell various things, without competition. Surprisingly, cruise lines don’t seem to form relationships with airlines; our plane ticket was completely separate from our cruise ticket. Our plane tickets (Boston to San Juan) were more expensive ($1,400) than our cruise tickets. Cruise ships are known for great food, and ours was no exception. You could have whatever you want, eat as much as you want, eat anytime, take your food anywhere. Some veteran cruisers become overweight. After their third or fourth cruise, they’re unable to walk, so they move around the ship on an electric scooter. If you want to stay out of the Scooter Set, you can use the jogging/walking track on the top deck, which is especially pleasant in the morning, when the deck is uncrowded, and the sun is low. If you want to avoid the sun altogether, you can exercise by climbing the twelve flights of stairs, then taking the elevator back to Deck 1, and repeating the process; this will tire you even more quickly than the jogging track. The crew hailed from more than 60 different countries. Many were from the Philippines and Indonesia. Few, if any, were from Arab countries, and few were from the U.S. They each wore a badge with their name, and country of origin. Why is the crew so international? Perhaps the cruise line is able to hire better people, for less money, if they hire non-Americans, or perhaps they feel that an international crew is more interesting for their passengers. Most of the passengers were from the U.S., some from Latin America, a few from Europe. Cruise ships are known for live entertainment — Broadway shows, classical music, pool-side bands, talent shows, etc. The ship had a large theater for live performances, as well as a small theater for movies. A Master of Ceremonies introduced each performer. One night, he said, “The women in the audience look fabulous tonight. Let’s have a round of applause for the women in the audience.” He followed that with, “And don’t the men in the audience look great tonight? Let’s hear it for the men in the audience.” Evidently everyone looked great. On Sunday morning, we docked in the capital of St. Thomas, Charlotte Amalie, which is named after a Danish queen. For centuries, the Danes controlled what are now the U.S. Virgin Islands (St. Thomas, St. Croix, and St. John), and their influence is apparent in the names of towns and streets. In 1917, the U.S. purchased these islands from Denmark because the U.S. was concerned about German subs in the Caribbean. When I asked our cab driver why people drive on the left in St. Thomas, he said “British influence.” I responded: “But Denmark controlled the island for a long time, and since 1917, the U.S. owns the islands...” He became furious that I had said his island was “owned” by the U.S. In that word “owned,” he heard the clink of chains, he remembered centuries of slavery. He requested that I re-phrase my remark. I asked him how he would describe the relationship. He said, “if the islands are ‘owned’ by the U.S., then what are we islanders? We’re nothing!” He asked what benefit there was to him in this U.S. connection. Clearly, there’s some anti-American feeling in the U.S. Virgin Islands, but I didn’t detect any independence movement. While France, England, Spain, and Holland were often at war, Denmark sometimes stayed neutral, hence St. Thomas was “open for business,” open to ships of all nations. Charlotte Amalie has long been a commercial hub, and it has several places of historic interest, such as Hotel 1829, Blackbeard’s Castle, 99 Steps, and a synagogue built in 1833. St. Thomas calls itself “the Williamsburg of the Caribbean.” Charlotte Amalie is a favorite destination of cruise ships, and it’s chock full of jewelry stores and gift shops. History is there, but you have to look hard for it. My daughter was in no mood to look for history, let alone look hard for it. Our ship was a mile from the heart of Charlotte Amalie, and a mile for a 12-year-old is a long way, especially when the sun is hot. Indeed, it wasn’t easy just to get off the giant pier to which our ship was tied. On the way back to the ship, we opted for a taxi. 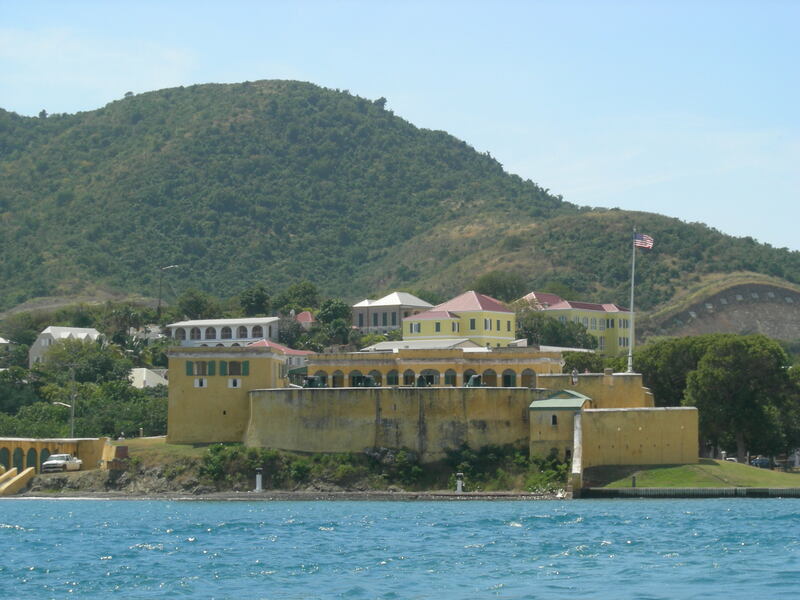 Our next port was Frederiksted, on St. Croix. Frederiksted is a quiet little town, perhaps the smallest town that we docked at during our cruise. The largest town on St. Croix is Christiansted, which has a well-preserved historic district, including the warehouse in which Alexander Hamilton worked in his early years. Both Frederiksted and Christiansted are named after Danish kings. We took a bus to Christiansted, then a boat to Buck Island, a well-known snorkeling spot. We enjoyed the snorkeling, but our guides were impatient to return to Christiansted, and take out another group, so we didn’t disembark on Buck Island, or climb the hill that our guide-book recommended (“an easy 20-minute hike leads uphill to an overlook for a bird’s-eye view of the reef below”13). This was our first official “shore excursion” and we didn’t take another. Like St. Thomas, St. Croix has a statue commemorating the emancipation of the slaves, which took place in 1848. Before emancipation, there were slave revolts; perhaps the slaves were freed more from policy than from pity. Many of the slaves worked on sugar plantations. In the late 1800s, when beet sugar began to replace cane sugar, the economy of many Caribbean islands declined, and didn’t revive until tourism developed in the 1950s. While St. Thomas is crowded and commercial, St. Croix is less so, and St. John still less. Parks make up 60% of St. John. St. John is known for quiet eco-resorts like Maho Bay. 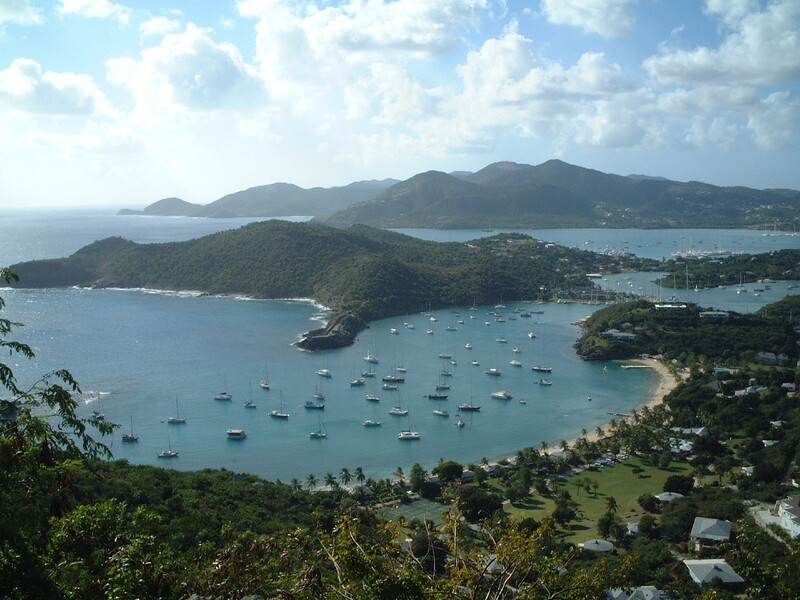 St. John attracts the wealthiest tourists. Situated almost 800 feet above sea level, this remarkable fortress is one of the most dramatic spots in the entire Caribbean, both historically and aesthetically. It commands astounding views of the Caribbean, including Nevis, Sint Eustatius, Montserrat, Saba, St. Martin and Saint Barth�lemy. We passed up the chance to tour Brimstone Hill, opting instead for a visit to the beach. We took a taxi across the island to a big Marriott Hotel, and swam in the Atlantic Ocean. Like many of the islands we visited, St. Kitts has dormant volcanoes, the highest of which is Mount Liamuiga at 3,792 feet. If I visit the Caribbean again, I’d like to do some hiking. Our next port was St. John’s, the capital of Antigua. When we went ashore, a taxi driver offered us an island tour. He said he would take us to English Harbor, home of the historic naval station known as Nelson’s Dockyard. He also said he would take us to the rain forest (many of the islands we visited have some rain forest), and drive back along the scenic western shore. He kept his word (we never had a problem with taxi drivers), and it was a good tour; we enjoyed chatting with him, and we enjoyed the sights. I think it was on Antigua that we saw the stone towers that were once windmills, used in sugar-production. When we first began talking to him, a woman approached my daughter, and offered to braid her hair. When I asked her the price, she said “two dollars.” I immediately agreed. I should have been suspicious of the low price. When she finished, I held out my money, but she said no, it was $2 for each braid, a total of $14, and she pointed to a sign confirming that price. I should have protested, and quoted her initial price of $2, but instead I paid the $14. There’s often a policeman in the market-place, and I should have suggested that we go to him, and let him resolve the dispute. An experience like this leaves you blaming yourself, and doubting everything that the islanders say. There are a few Rastafarians (or “Rastas”) on each island. They worship the late Haile Selassie, Emperor of Ethiopia, as a divine being. Our driver said that when the Rastas are having a church service, it looks like the building is on fire because they’re smoking so much marijuana (marijuana is a kind of sacrament for Rastas). Nelson’s Dockyard is well-preserved. It’s named after Horatio Nelson, who was in charge here for several years. Even today, English Harbor and nearby Falmouth Harbor are popular with sailors. The English Navy valued English Harbor as a safe haven during hurricane season, and also as an easy place to defend against attackers; they made it their chief Caribbean base. Time should be taken when visiting Nelson’s Dockyard to follow the path to Fort Berkeley. It is only a ten-minute stroll each way and the unfolding views of the harbor are spectacular. The fort is placed on the peninsula forming the west entrance to English Harbour. It was started in 1704, or 21 years before the Dockyard was built.... On approaching the battlements from a footpath starting at the Dockyard dinghy wharf, a stone quarry may be seen on the right. This quarry supplied the building materials for the fort. English Harbor (and Nelson’s Dockyard), as seen from Shirley Heights. The big harbor in the distance is Falmouth Harbor. 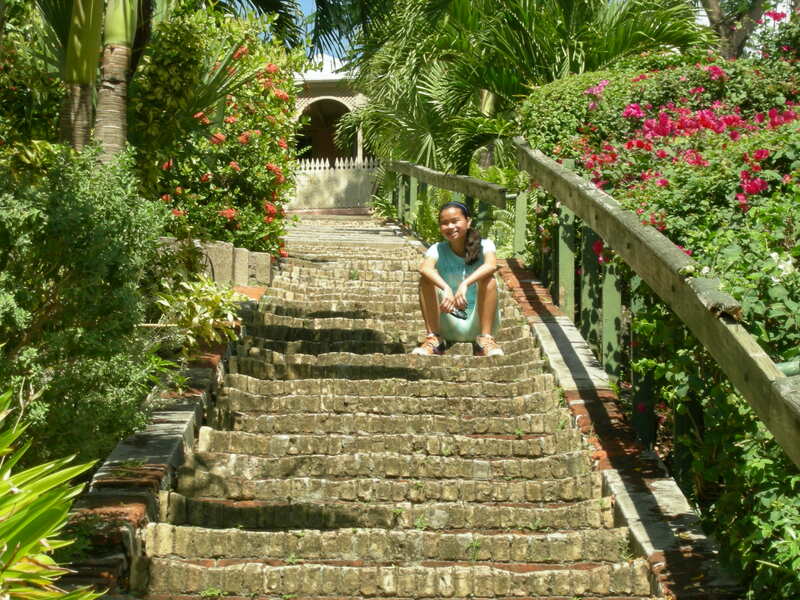 Another of Antigua’s attractions is a plantation-museum called Betty’s Hope, but we didn’t make it there. As we were driving, I noticed an unusual mammal on the side of the road — rather like a squirrel, but somewhat longer, tan-colored, with a thin tail, rather than a bushy tail. Our driver said it was a mongoose. They were introduced to the islands to kill snakes, but now they’re disliked because they kill chickens. Finally we decided to flee to the ship, where no one would ask us if we needed a taxi. Thus, we saw nothing of St. Lucia. If only our ship had sailed past The Pitons, so we could have had a good view of them, without a long drive! When we left St. Lucia, we headed straight for San Juan, and we couldn’t see any islands — just water on all sides, as far as the eye could see. A common problem with cruises is stomach illness, which can sweep through a ship, infecting hundreds of passengers and crew. Aware of this problem, our ship doled out hand sanitizer frequently. Nonetheless, a stomach bug began going around, so hand sanitizer was used even more, until the tables and chairs were fairly dripping with it. Perhaps the most common cruise-ship illness is Norovirus, and you may be able to take something to defend against it before you board your ship. We went on a cruise line called Celebrity. Perhaps we should have chosen a different cruise line since Celebrity doesn’t have a family emphasis, and my daughter wasn’t able to find any playmates or make any friends; most of the passengers were couples over 60, traveling without children. Perhaps Royal Caribbean is more child-friendly. For more information, read some cruise reviews at a site like CruiseCritic. Our ship, Celebrity Summit, is about 300 meters long, and has space for about 2,500 passengers and 1,000 crew. There are several cruise ships larger than ours, such as Cunard’s Queen Mary 2. The largest cruise ship, Royal Caribbean’s Oasis of the Seas, is about 360 meters long, and has space for about 6,000 passengers and 2,000 crew. These larger ships are sometimes unable to dock, and must transport passengers to land using small boats called “tenders” (we used tenders only once — at St. Lucia). Also, these larger ships may be unable to sail through the Panama Canal, so they must sail around Cape Horn to pass from the Atlantic to the Pacific (likewise, the largest oil tankers can’t go through the Strait of Malacca). A prominent Hollywood director, Roland Emmerich, is making a movie about the real Shakespeare. It’s called Anonymous, and will begin filming soon. And a new book about the real Shakespeare is coming out in early April; it’s called Shakespeare’s Lost Kingdom: The True History of Shakespeare and Elizabeth. The author is Charles Beauclerk, Oxfordian spokesman and descendant of the real Shakespeare. Beauclerk features prominently in the Frontline documentary about Shakespeare. Sonnet 148 is somewhat obscure. I’m being generous to The Bard by placing it among his Greatest Hits; perhaps it belongs among his Mediocre Productions. In Sonnet 148, the poet says that his eyes tell him that the beloved is beautiful, but his judgment, and public opinion, say that she isn’t beautiful. In general, I think the sonnets deal with Shakespeare’s love for his son, Southampton, but some sonnets, including this one, deal with a different love — perhaps a mistress, or a wife, or an imaginary woman.